The most surprising fact about Ancient Egyptian Fashion was that it changed so little over a period of 3000 years. Difficult to imagine when modern western society fashion changes with every season! But why was there so little change in Ancient Egyptian fashion? To answer that question we have to establish what type of clothes they actually wore and when there were any changes in fashion we need to discover what influenced the change. Egyptian fashion was dictated by the materials that were available in Egypt. Cotton was not grown in Egypt and there were no wool- bearing sheep. The climate in Egypt is hot and dry and materials used to make the clothes had to reflect this. 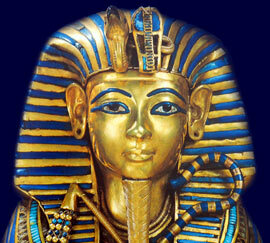 The Ancient Egyptians therefore used linen which was a light, cool, non-restrictive and comfortable material. The linen cloth was made from flax which was produced either in the home or in temples or workshops of the royal palace. Different types of linen were produced ranging from a coarse, sackcloth type of material to the finest, almost transparent white linen. The most wealthy Egyptians and members of the royal family wore the finest white linen which was frequently washed and for a radiant finish the clothes was bleached and starched. Fashion dictated that the linen clothes worn by the richest women was so fine that it was transparent. The colors used in Egyptian fashion were predominantly white. Not only was white a good color to wear in the sun and the heat, the color white also symbolized purity. Decoration and color came from elaborate and colorful jewelry together with wigs and make-up. Blue and brown dyes were only occasionally used to color the linen in the early Egyptian periods. Egyptian fashion and the use of colors changed in the age of the New Kingdom when the process for fixing dyes were discovered. Fashion in relation to different colors changed and fashion became became brighter with the use of red, blue, brown, gold and green colors and fashion designs became more elaborate. The dress of a woman in the Old Kingdom was made with a simple rectangle of linen cloth into an ankle length tube dress. The dress was stitched down one side and straps were attached to the top edge of the dress The straps were then knotted or fastened with a buckle. Some dresses had short sleeves or women wore short robes tied over their shoulders. Fashion changed in the period of the Middle Kingdom when patterned and colorful collars were worn and the style became more elaborate. New Kingdom fashion for women changed due to the advances in dye fixatives allowing for the use of more colorful linen in fashion. The simple tube dress remained but dresses were adorned by an elaborate pleated and fringed robe which was worn over the dress. Wealthy Egyptian women also decorated their dress with embroidery, feathers, sequins and different types of rosettes. The fine, almost sheer linen was accompanied by pieces of jewelry which covered various parts of their anatomy. The pectoral was an elaborate piece of jewelry worn on the chest which masked the hollow between the breasts - which often took the shapes of falcons and scarabs. Fashion changed more for men than for women in Ancient Egypt. Men's fashion in the Old Kingdom consisted of a knee-length kilt which was knotted, or fastened with a buckle, at the waist. Men's fashion changed in the period of the Middle Kingdom when the kilts became longer and straighter. Full length cloaks were also worn by the men during the winter. Fashion changed the look of men's clothing again during the period of the New Kingdom. Advances in dye fixatives allowed for the use of more colorful linen and the kilt was elaborately pleated and fringed. Elaborate sashes and aprons were also added to complete the change in fashion of men's clothing as were wide-sleeved tunics and under-kilts. The simplicity of the style of Egyptian fashion changed very little through the many hundreds of years of the Old Kingdom. The clothes needed very little stitching as they were simply draped around the body, however the higher the status of the person the more clothes and make-up they wore. Ancient Egyptian Fashion changed in the period of the Middle Kingdom when patterned and colorful collars were worn. Fashion changed the look of Egyptian clothing again during the period of the New Kingdom when advances in dye fixatives allowed for more colorful linen and a variety of colors. The simple tube dress was then adorned by an elaborate pleated and fringed robe which was worn over the dress, according to the New Kingdom fashion. The period of the New Kingdom also saw fashion change when wealthy Egyptian women decorated their dress with feathers and sequins. Fashion in the New Kingdom was influenced by the Syrians and embroidery was introduced to Ancient Egyptian fashion.